Smoked Bamboo Mekugi for Japanese Swords 2 Pc. This is our collection of Japanese katana, that range from fully functional swords to display and wall hanger pieces. At SwordNArmory, we offer a variety of swords, medieval armory, knives, and martial arts weapons for collectors, as well as for stage and costume use. 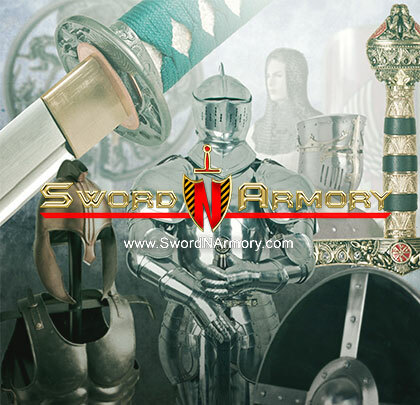 Located in Pomona, CA, SwordNArmory carries affordable and high-quality roman armor and medieval armor for all ages. From an anime sword to a handmade sword, SwordNArmory is your one-stop-shop for high quality battle ready katanas and medieval armory. With an extensive online catalog and daily deals on featured SCA armor, there is always something new and exciting to discover under the medieval roof at SwordNArmory. So, whether you are a collector or simply shopping for the perfect Viking sword present, as one of the largest online distributors of medieval armory, SwordNArmory has all the armory of the past and present. Made by highly skilled craftsmen with exquisite attention to detail, each custom and handmade sword at SwordNArmory is available in over 160 different styles from Musashi Swords to handmade Tanto Swords. With a unique design and special steel blade for the right balance of style and functionality, each handmade sword is made of the highest quality materials for years of use. Additionally, the armory selection boasts chainmail armor, knights armor, fantasy armor, medieval shields, helmets, medieval times weapons, battle ready katanas, accessories for carrying your Korean sword and much more. From a throwing knife and spring assisted knife to Machete knives and pocketknives, SwordNArmory stocks 1,150 varieties of knives with different sized blades and folding functionalities for specific usage. Regardless of the size, these medieval times weapons pack a sharp punch. Shop SwordNArmory's medieval armor today and find everything you need at the best prices available. Have Questions? Don't hesitate to ask. We are here to help.